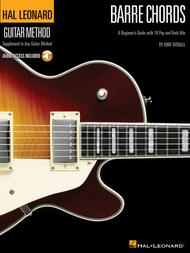 A Beginner's Guide with 18 Pop and Rock Hits Hal Leonard Guitar Method. Guitar Method. Method, Chords. Softcover Audio Online. 48 pages. Published by Hal Leonard (HL.697406). Learn how to play barre chords with real rock songs! This beginner's guide teaches you the chord progressions behind many great pop and rock hits, from The Beatles and the Beach Boys to Maroon5 and the Foo Fighters. Includes tracks for all the songs in the book, including: All My Loving • Creep • I Can't Explain • Just like Heaven • Layla • Santeria • (Sittin' On) the Dock of the Bay • Stray Cat Strut • Suffragette City • and more. The price of this book includes a unique code that provides access to audio tracks online, for download or streaming. The tracks include PLAYBACK+, a multi-functional audio player that allows you to slow down audio without changing pitch, set loop points, change keys, and pan left or right – available exclusively from Hal Leonard. The world-famous Hal Leonard Guitar Method is preferred by teachers because it makes them more effective while making their job easier. Students enjoy its easy-to-follow format that gives them a solid music education while letting them play songs right away. 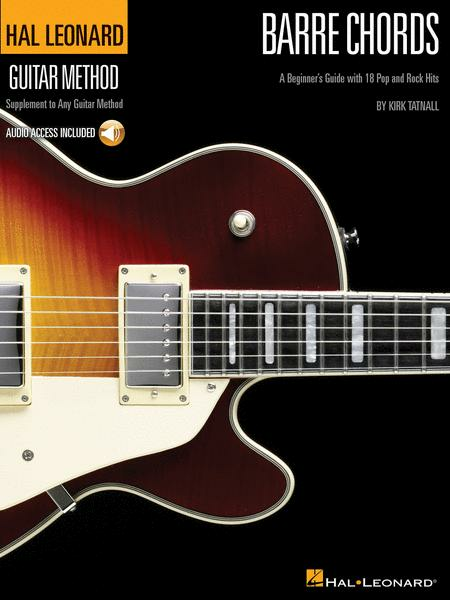 The Hal Leonard Guitar Method provides a complete system to playing success which includes three levels of instruction and a myriad of play-along supplemental songbooks that let students play great songs while they're still learning to play.